Dolores, along with her son, Kraig and his girlfriend Mia, were in Paris visiting some friends. On a particularly beautiful day, we meet at the Gare de Châtelet – Les Halles (not without a bit of confusion) to catch the RER B to CDG to pick up a car for our trip to the country. We head first to the beautiful town of Fontainebleau for lunch and to meet up with other friends for our weekend getaway. 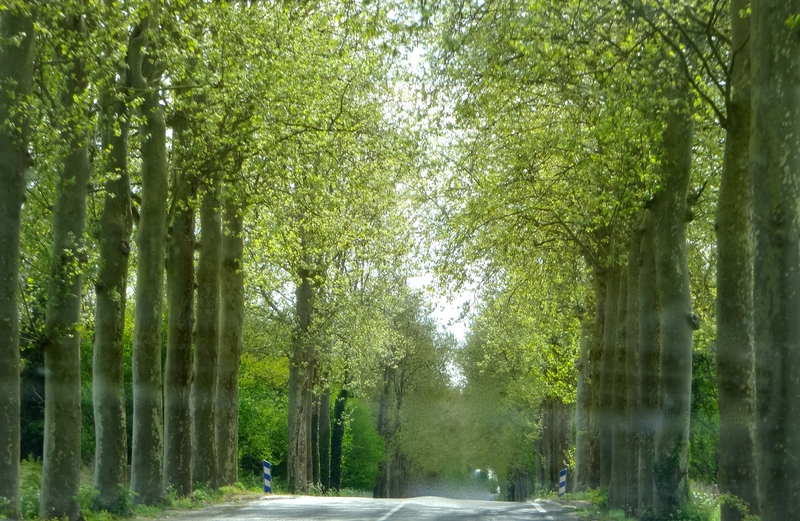 Driving through the famous Fontainebleau forest, I notice how clean it is. No fallen trees or other detritus littering the forest floor. And while the woods are fairly dense … you can’t see to the farm land beyond … the trees are not yet in full foliage and the sun bounces off the bright green of the new Springtime leaves creating an echo that transcends time. It’s like driving through history, the soft rustling and dancing sunlight hypnotic. 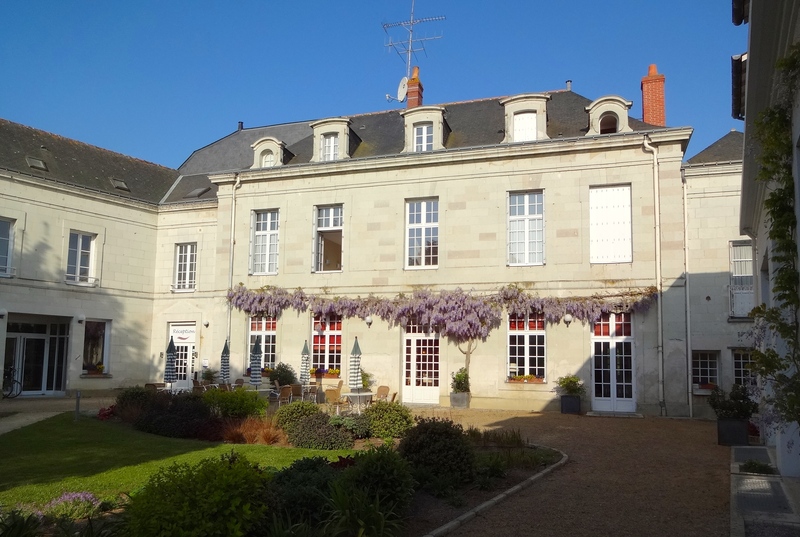 It’s Easter weekend, and with our last minute decision, we are able only to find a hotel in Saint-Martin-de-la-Place, a small town to the west of Saumur nestled on the right bank of the Loire. The hotel, Domaine de la Blairie, is quiet and lush with Spring flowers. The wisteria is in full bloom, yellow and purple pansies stand out against the backdrop of the white stone buildings surrounding the courtyard. A lovely park area is in the back where we sit with a bottle of local wine to watch the sunset strip away the day. 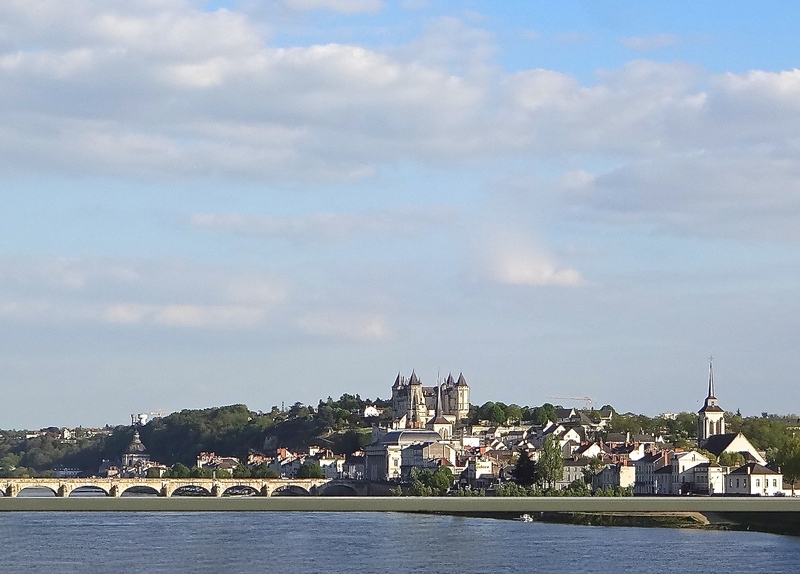 The historic town of Saumur, located a short distance from Saint-Martin-de-la-Place, is on the left bank of the Loire River in the Loire Valley Wine Region. As we drive across the bridge, we see its very famous Château on a hill overlooking the city. As we continue toward the city center, we pass the École Nationale d’Équitation (National School of Horsemanship) and see that a horse show is in progress. We find a parking spot and walk through a narrow passageway to the square. 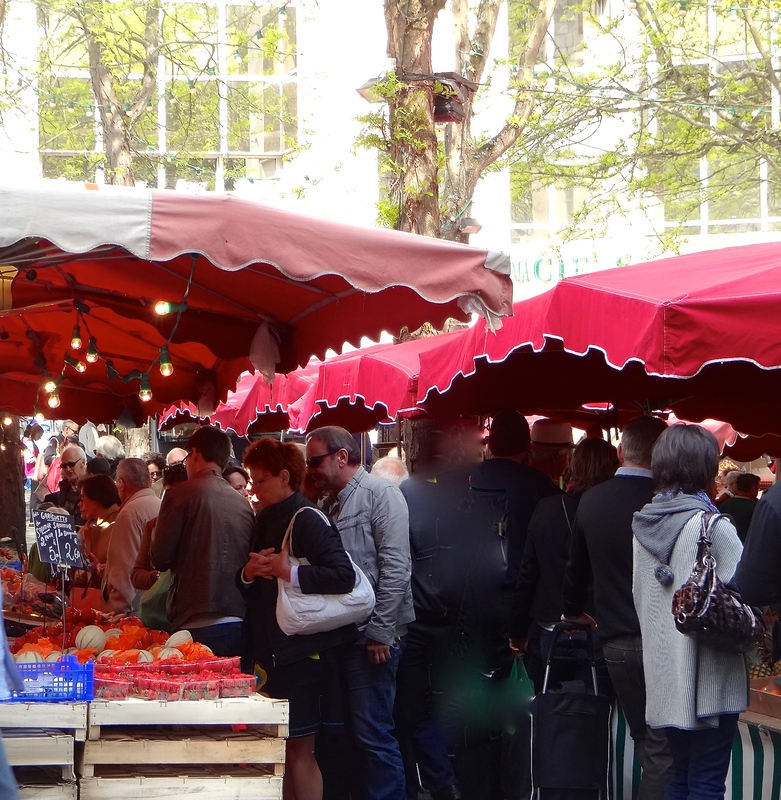 As anticipated, a very busy local “le marché” is in progress. The market has stalls of all types bursting with produce, overloaded with cheese, meat stations selling freshly-made country pâté and other fresh and cooked products, fish mongers, pastry and bread vendors, as well as clothing and other items. Olives and tools sit side-by-side, with cut flowers and plants adding a bit of color. Many of the stalls loaded with fruit and vegetables are marked Bio meaning organic. The produce is colorful and very fresh. Mia and Kraig have reserved bicycles (free from the hotel) for a ride along the river, and so they pick up a few items for a picnic. After lunch at a little crêperie on the square, we decide to walk to a local Saumur winery. Living beneath this city of cool white limestone for centuries lie many miles of caves. 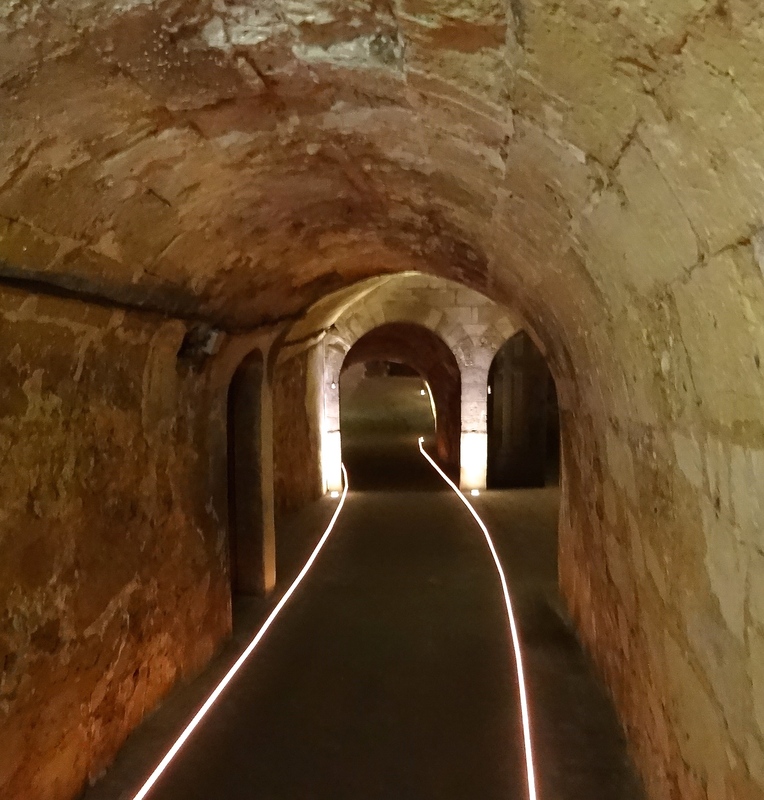 This underground ‘city’ of dark, damp, perfectly cool caves has moved through time as a living structure; first as home to mushrooms, and finally since 1859, expertly used to render the Grenelle wines. 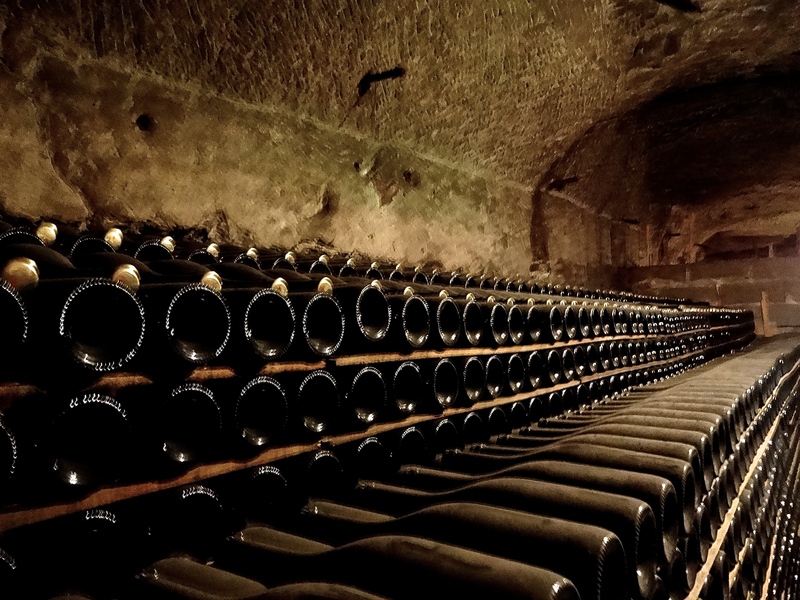 Two and a half kilometers of these underground caves belong to the Cave of Louis de Grenelle, the last remaining family-owned property producing Saumur sparkling wines. The wine is fermented and aged in tanks and produced using the Méthode Champenoise. 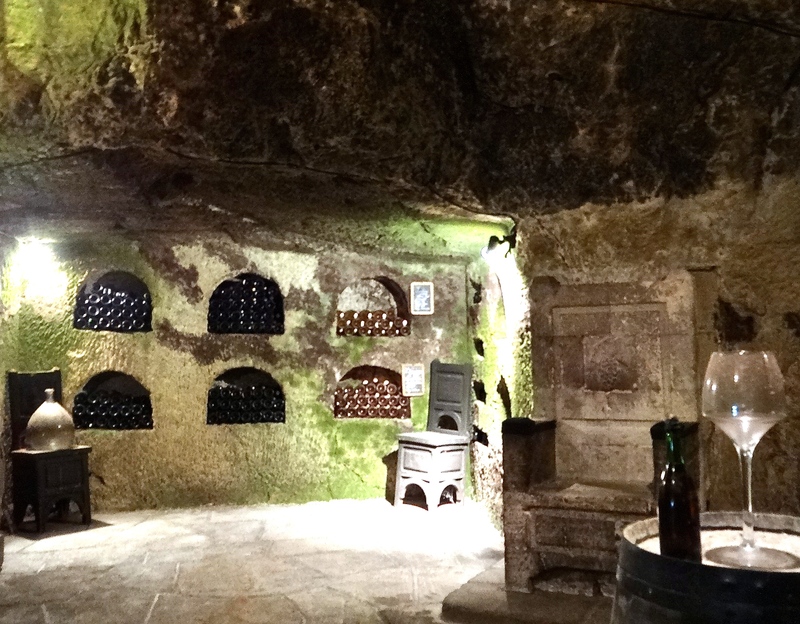 The wine is left to age in bottles in the caves for up to several years, depending on the varietal. From our expert English speaking tour guide, we learn about the process for creating their wine. After the wine is aged, the bottles are gradually tipped and turned over a period of time (a month if by hand or two weeks if semi-automated). This process causes the yeast to move to the neck of the bottle, which is then dipped into a cooling vat effectively freezing the yeast onto the bottle cap. When the cap comes off, the yeast is also removed leaving a perfectly clear bottle of sparkling wine. Once corked, it’s ready for market. This winery produces rich sparkling wine, using Chenin, Chardonnay and Cabernet Franc grapes. We find the wine from our subsequent tasting to be crisp and dry. While some bottles are sweeter, they are not overly sugary. 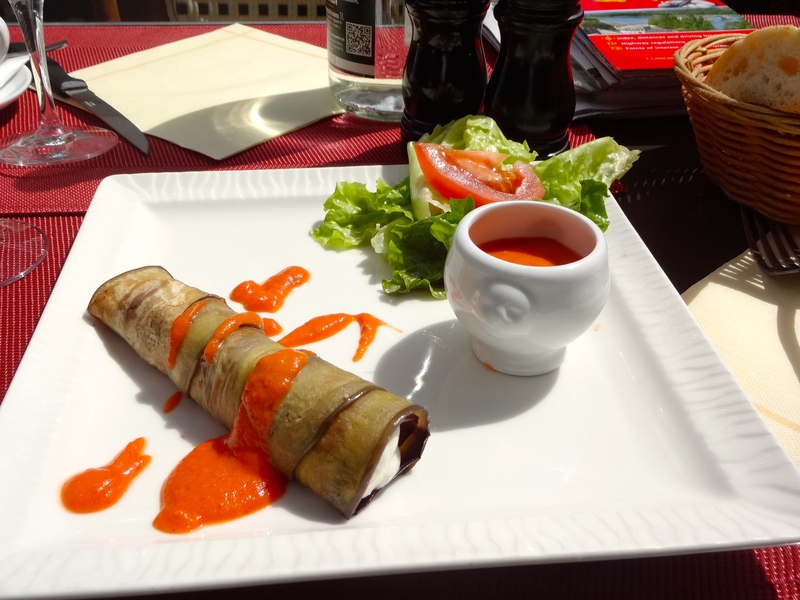 With delicate flavors and overtones, they are quite delicious. 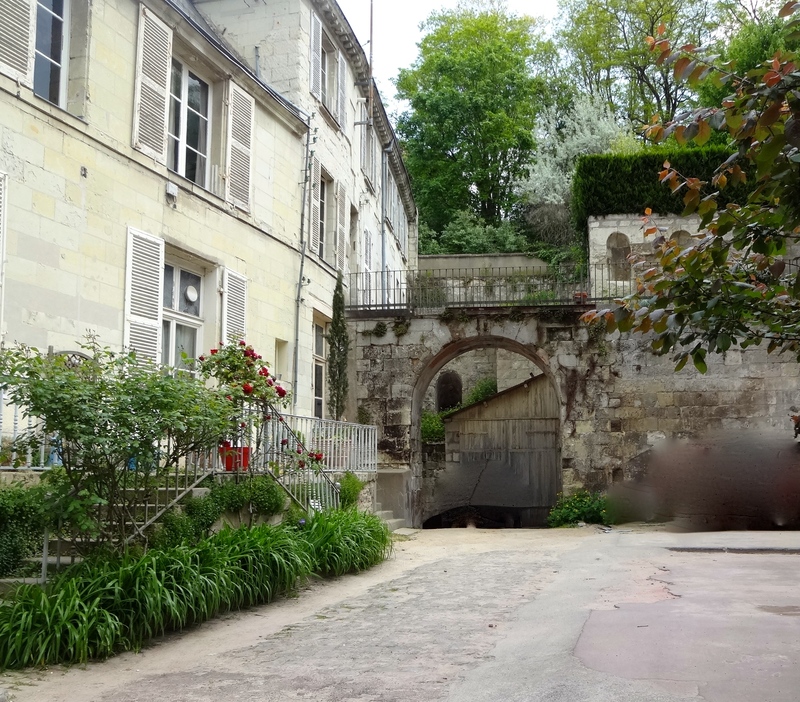 After our tour and tasting, we walk back through the quiet streets of Saumur, with its courtyards and ancient buildings. 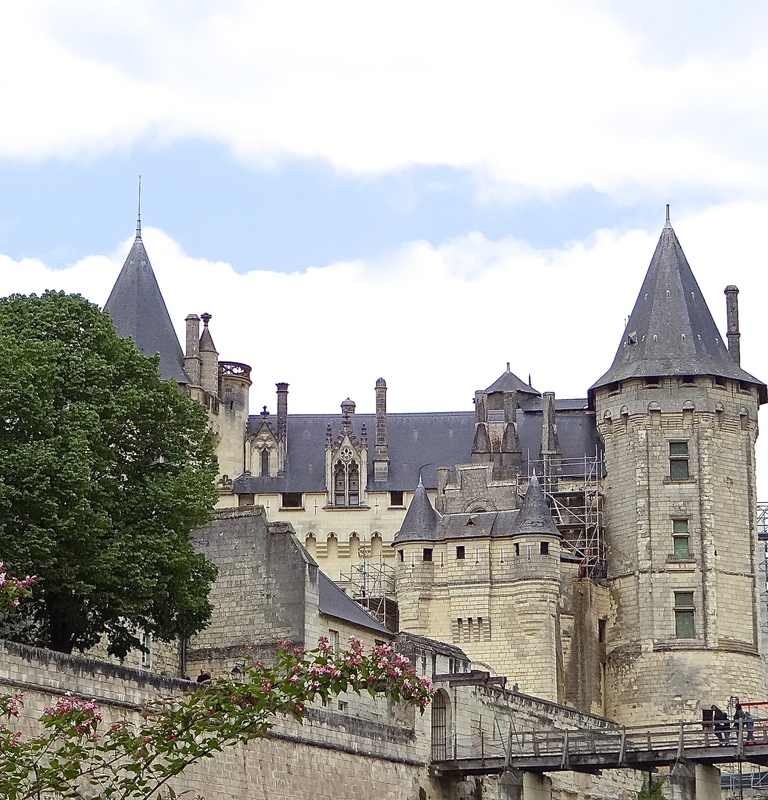 We are heading toward the Château de Saumur, high on the hill looking proud and resolute in its beauty. As the clouds move across the sky, the white stone reflects the sun bringing with it a brilliance that seems to yearn for a past age where horses clamored across the wooden bridge above a mote replete with deep water. The ancient and the new coalesce in the white city and you can feel the presence of the past as easily as you can see the signs of the present. This entry was posted in France, Travel and tagged Cabernet Franc, Cave of Louis de Grenelle, Chardonnay, Château de Saumur, Chenin, Domaine de la Blairie, Fontainebleau, Fontainebleau forest, French markets, French Wine, le marché, Loire Valley, Loire Valley Wine Region, Méthode Champenoise, Saint-Martin-de-la-Place, Saumur, sparkling wines.